PVI Solid Ramp is a non-folding ramp with durable welded construction, anit-slip surface, 800lb capacity. 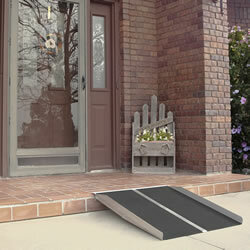 PVI Solid Ramp is a non-folding ramp with durable welded construction, anit-slip surface, 800lb capacity. Full platform provides excellent stability. SL330 3' 30" 15 lbs. 800 lbs. SL336 3' 36" 18 lbs. 800 lbs. SL430 4' 30" 20 lbs. 800 lbs. SL436 4' 36" 23 lbs. 800 lbs. SL530 5' 30" 25 lbs. 800 lbs. SL536 5' 36" 30 lbs. 800 lbs.